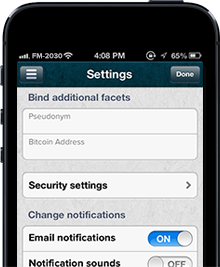 We’ve added a new Facet to Gliph accounts that lets you save and share a Bitcoin wallet address. This means you can connect with another Gliph to discuss at transaction. If you decide to go through with it, you can use Gliph to securely share the wallet address. This entry was posted in Bitcoin, Gliph Android App, Gliph iPhone App, Gliph Web App and tagged cryptocurrency on March 29, 2013 by rob.